We’re looking at a breakdown of law and order. By that, I mean if the government shutdown continues another week, even the federal courts will run out of money. They will lose the ability to function with any semblance of normality. And that’s just the tip of the iceberg. At 28 days long as of Friday, this government shutdown is the longest on record. It has become the Mother of all Shutdowns. On the bright side, it is setting up some tremendous profit opportunities. Profits. For. YOU. Now, I already told you how the White House said the economic impact of the shutdown will be TWICE as bad as first thought. And I also told you how 800,000 federal employees are going without pay, and up to 4 million government contractors are suddenly left without income. The impact of the shutdown on America’s economy is … so far … about $6.7 billion a week. Or equal to what President Trump is demanding for border wall funding. 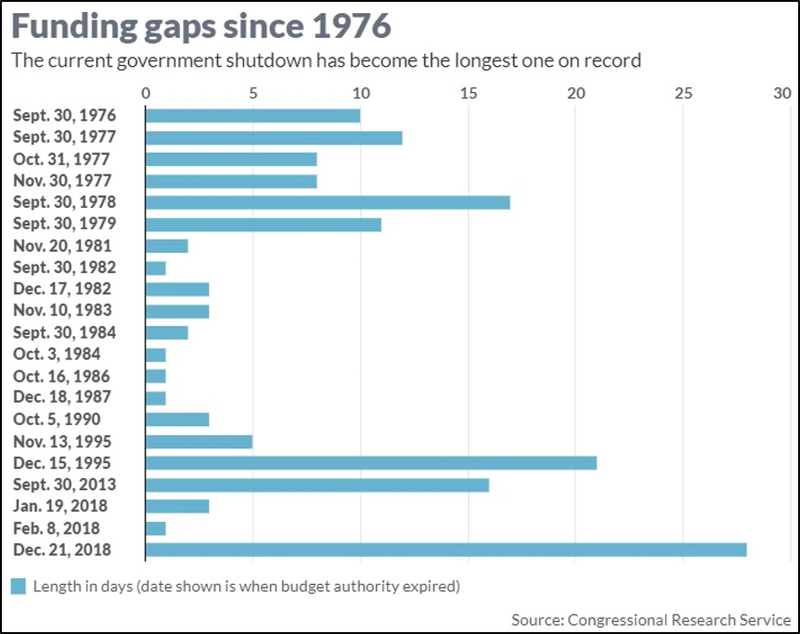 But the fact is, we don’t know how bad the shutdown is because we can’t measure it. Many of the agencies that measure the economy are furloughed right now. The Commerce Department in particular will be missed. It should be reporting retail sales, personal income and spending data. It ain’t. It’s like America is living in a weird reality show where someone keeps shutting out the lights. Exactly who is at fault is a topic of heated argument. Personally, I would just like the lights to come back on. In the meantime, the market is soaring on chatter in both Washington and Beijing that the trade fracas between the U.S. and China will end sooner rather than later. That’s why it was a great week for the market. However, the S&P 500 is STILL in its recent downtrend. It has further overhead resistance above that. 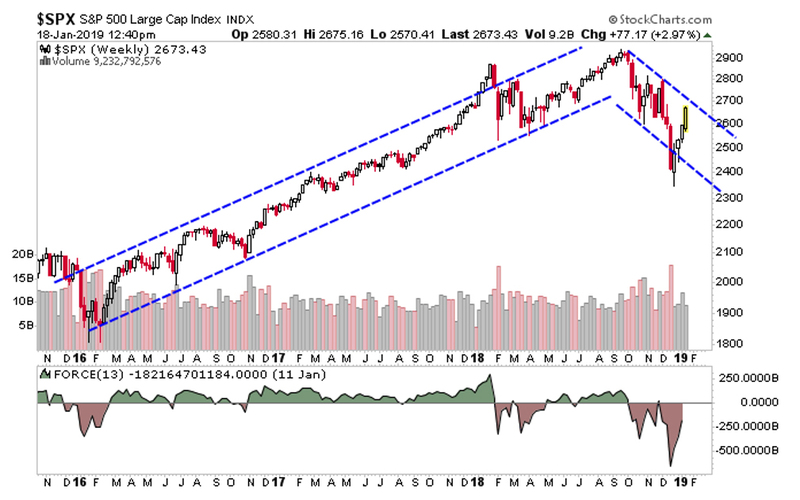 I tell ya, this could be “The Kiss Before the Swoon.” Though I expect markets to keep zig-zagging before the big roll-over in April. The funny thing about that happy trade chatter: Neither side has offered any specifics. Maybe they don’t have any specifics? Man, imagine the market disappointment if the trade talks hit ANOTHER roadblock. 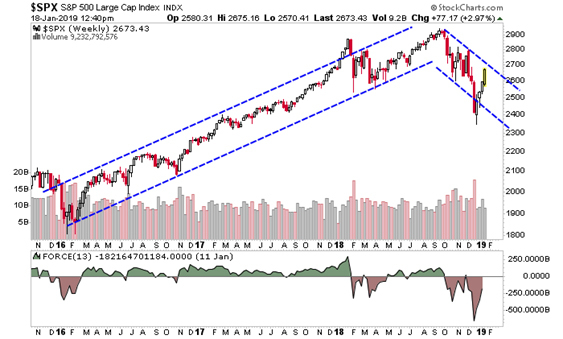 If that happened, the big bearish event I’m looking for in April might accelerate. Let me share two charts from Andrew Lapthorne at Société Générale. 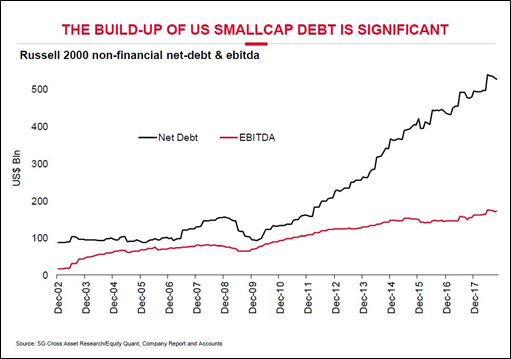 First, if the bear roars again, small caps are going to get creamed. Why? Because they’ve been running up debt like my wife when Macy’s has a huge sale. Debt is more of a problem for small caps because a small company with balance-sheet problems can’t do what the big boys do — raise money easily. 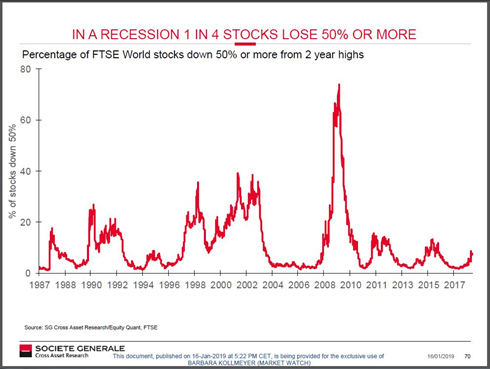 As SocGen has tracked, and you can see, one in four U.S. stocks sees 50% or more of its value erased in a recession. On the bright side, there are exciting profit opportunities ripe for the taking RIGHT NOW. Furthermore, all my cycles analysis show that the profit potential available in select investments could grow more explosive by the day. There are two investments in particular I’m watching like a hawk and could pull the trigger on at any moment. And this coming Tuesday in our next “Supercycle Market Update,” I’m going to give their names and ticker symbols to those who register to attend. If you haven’t registered yet, there’s still time. Just click this link here and we’ll send you the event details. 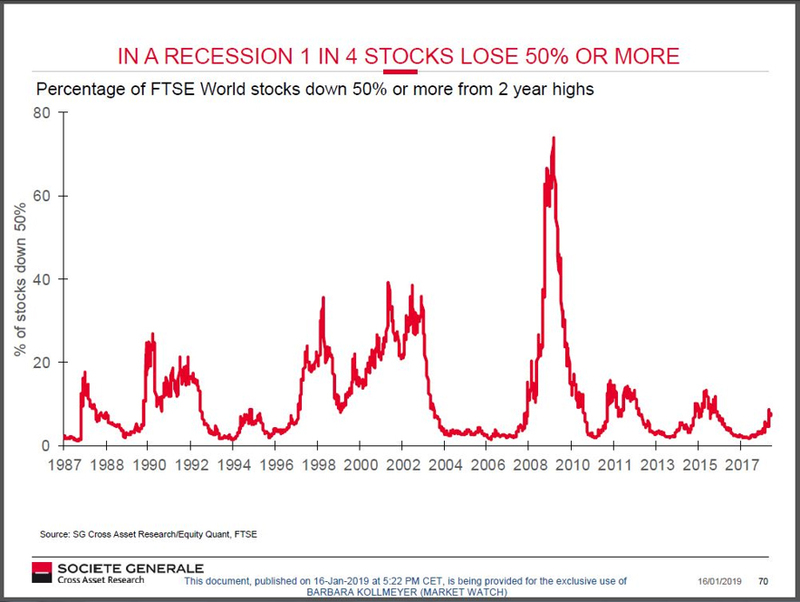 Precisely WHEN will the growing economic and political crisis reach critical mass? What will happen to stocks, bonds, gold, gold shares, and oil in the coming days and weeks? Which specific investments should you sell and which should you buy for the ultimate in protection and profits? Fortunately, there’s an easy way to make sure you don’t miss a morsel of valuable information. All you need is a simple one-click to this link, and you will get your free ticket to Tuesday’s conference. Plus the NAMES of two red-hot “buys” I could pull the trigger on at any moment! If I am working and not around to catch these videos, how do we here them independently at night?